Its been a while since Vizag experienced cold weather with drizzles. The nights are getting chillier and am just loving the weather though it breaks my heart to see Nehal go to school in such cold weather. You see, its rare to find kids wearing sweaters (unless sick) to school in Vizag with this year being an exception. I tell myself its just few more days before school closes for winter vacation (5 1/2 weeks). Winter holidays, now that’s another story. 1 Prepare schezwan sauce. Strain the water from the red chilies and grind to a fine past with ginger and garlic. Heat oil in a pan, add the paste and saute for 4 mts. Add red chili paste and saute for another 2 mts. Add soy sauce, sugar, salt and 3-4 tbsps water. Cook for a mt. Add vinegar and cook for a few secs and turn off heat. Cool and refrigerate. Its can be stored for few weeks. 2 Heat a wok with sesame oil till piping hot, add the spring onions and stir fry for 1 mt on high. 3 Add the rest of the vegetables and toss them on high heat for 4 mts. 4 Add salt, pepper pwd and brown sugar and combine. Add the schewan sauce and mix. Add the drained noodles and combine well. 5 Toss the noodles and vegetables on high heat for a few secs. Turn off heat. Garnish with chopped spring onion greens and serve hot. Hi Sailu, thats a great recipe and an all time fav in our household too. love the presentation. Thanks for the invite, Sayantani. Sent you an email. can u help me to make soups and manchuria!! 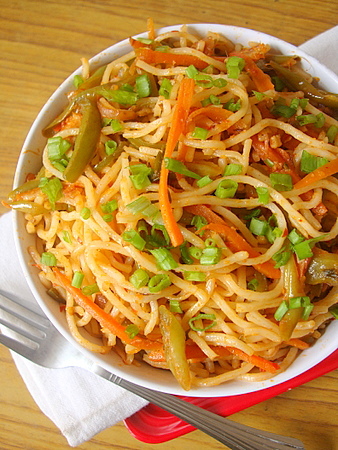 Am ready to finish that whole bowl, very tempting schezwan noodles..
Looks yum ! I too am in Vizag, Lets meet, Sailuji ! Ur recipe is awesome. I am the silent visitor to your site. Can I know what egg noodles specifically means? When you buy noodles from the stores, the packet specifies if its Rice Noodles or Egg Noodles. You can use either of them. Ur recipes r amazing ….am a big fan of ur cooking…. A sure try for me…YUMMY!!!!! I want to find out what type of vineger you used in receipe? Like rice vineger or apple cider or some other type? Please clarify me. This is also my family fav. I visit your site very frequently and I use your recipes, recommend to my friends too. Egg less noodles also available in Oriental stores. I buy different sizes (wide, thin, rice etc.,). Anyway, please post other oriental recipes. Hi Sailu.. thanks for this recipe.. What is brown sugar? Is it jaggery? If not, can I use jaggery instead? Yes, you can use jaggery. Jaggery is different from brown sugar. Brown sugar is partially or unrefined sugar with molasses. I am dying to prepare this but dont have egg noodles. 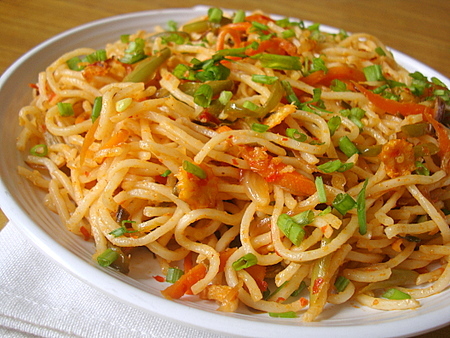 Do you have any recipes that can be made from maggi noodles? I have tons of packets of the masala variety and none wants to eat them as is. 1. Heat oil in a vessel, add a sliced onion and green chili and saute for 3 mts. Add mixed veggies and green peas and cook for 5 mts. Add kasuri methi, chili pwd, soya sauce, tomato sauce and little salt. Mix. Add maggi masala pwd and mix. Add enough water for veggies and noodles to cook. Bring to a boil. Add noodles and cook till done. Garnish with coriander leaves. 2. You can make a thick soup adding fresh greens like spinach and methi (fenugreek). 3. You can scramble eggs and add to the cooked maggi noodles. 5. You can even add sauteed boneless chicken along with spices and soy sauce/tomato sauce. 6. Prepare Noodles Bhelpuri. Break the noodles and roast in a heavy bottomed vessel for 7-8 mts. Add roasted peanuts, sev, papdi (crushed), puffed rice, onions, tomatoes, coriander leaves and mix. In a separate bow, add the maggi masala, sweet and sour chutney, green chutney, pinch chaat masala, pinch chili pwd and few tbsps water and mix. Pour this over the dry ingredients and combine. Garnish with sev and coriander leaves. 7. Another way is to make it pasta style. Cook maggi noodles with veggies and grate cheese and serve hot. Hi Sailu garu, Am a frequent visitor for ur website!!!! Am a beginner in cooking and your recipes are of a lot of help for me!!! Thank you…. what is red chilli sauce ? Tried the recipe was a hit. Cud u pls. post some more chinese reciipes? Also wud like 2 ask u …in case if i wud like to make Schezwan rice then do i simply need to substitute noodles with rice? I just tried this recipe over the spring break for my 7yr old daughter and she fell in love with it.She usually give me a thumb’s up when she love the food but this time she gave me a 2 thumb’s up. Thanks so much I really appreciate your work and keep posting new ones. i need…….. how to prepare soups.? I made this for a brunch potluck and was a super dooper hit! Thanks so much! Can you also please let us know the brands you use, so that we too get the same great taste. Right now I am using Ching’s Secret. Am satisfied with it. hi sailajagaru…………if we don’t have sesame or peanut oil …..can we use normal oil…..
HI! I enjoy reading and trying out your recipes. All have turn out well. For this recipe, can you tell me what is the weight of the 1 packet noodles? Thank you. It was amazing. I tried it and it instantly became a hit!!! Do keep making more like this. What is the second rec chilli sauce/paste that you add while making the schezwan sauce in Step#1?